In June 2016, Claire Callens (NIHR CRN West Midlands Patient and Public Involvement Officer) attended the International Children’s Advisory Network (iCAN), 5 day Research and Advocacy Summit in Barcelona. Claire Callens who co-leads and facilitates the NIHR Clinical Research Network West Midlands, Young Persons’ Steering Group was accompanied by Mohini aged 17, Mohini’s her mom Urvashi and Zac aged 18 years old. Young people were selected from the Young Persons’ Steering Group through an application process, rivalling that adopted by NHS jobs! Held in Barcelona, this summit brought together over 160 youth advisors, Young Persons’ group leaders, parents, regulators and scientific partners. These individuals travelled from 6 countries and 2 continents to attend. Previously held in Washington DC in 2015, this second summit was located at the Sant Joan De Deu Hospital, Barcelona. The summit was a combination of interactive sessions, educational workshops, research presentations, expert regulatory & scientific panels and recreational activities. The iCAN summit brought together young people from around the world to share best practise, develop relationships between likeminded young people and enabled creation of a collective voice from many cultures in order to tackle mutual research issues. Team West Midlands were attending in representation of both the NIHR Clinical Research Network West Midlands and as a founding member of the Generation R Alliance. They arrived at the Welcome Reception Dinner in Barcelona, early on the evening of Monday 27th June (the first day of the event) and were greeted by a flurry of enthusiastic team leaders and young people. Team West Midlands quickly integrated and networked with other members of iCAN from across the globe. Young members also had the opportunity to interact with other POD members. The PODs were a platform that saw the Young Persons’ members allocated to groups with other young people, of similar ages in order to promote interaction and develop friendships during the 5 day event. Over 5 days young people had the opportunity to participate in many different activities. This included a comprehensive tour of the summit venue Sant Joan De Deu Children’s Hospital. There were also various learning activities related to Clinical Research which included presentations about research projects taking place at Sant Joan De Deu Hospital; many of which had a real focus on improving the quality of life of children and young people. One highlight was the visit to ‘Cosmo Caxia Museum of Science’ which included a morning of presentations, notably from ‘Rare Commons (https://www.rarecommons.org/en/what-rare-commons) and the Dravet Syndrome Foundation’. Both presentations examined “rare” diseases and the role of research in treating and diagnosing them. These presentations highlighted not only the importance of research but the need for connection amongst patients. Families of children who do not have a diagnosis for their condition are in a very unique situation, and this can be a very isolating and scary situation. Connecting these families can help to create a friendly and supportive community and go some way to help ease some of their fears. The summit also saw young people interacting with Panels who were represented by regulatory authorities such as the European Medicines Agency (EMA) and The Food and Drug Administration (FDA). These panels explored how to ensure that young people involved in health care research can have a role in research alongside regulatory, scientific and commercial partners. There were opportunities to listen to these professionals and as always discussions emulated around encouraging more people, especially the younger generations to take part in research. The general consensus was that the social stigmas surrounding research still mean that recruitment to be problematic. Throughout the event there were also opportunities for Team West Midlands to network and make new contacts with people from within these organisations in the hope that our group and Generation R Alliance may work directly with them. The summit provided a mix of recreational and cultural activities with learning and educational opportunities. These included a visit to Camp Nou (Barcelona Football Club) and the Alίcia Foundation (http://www.alicia.cat/en/areas-of-activity/research- Read about their research into the Mediterranean diet and how this can help prevent diabetes and cardio vascular disease). These excursions provided lots of fun as well as lots of important educational points such as the importance of the need for young people to strive toward common values, as advocated by members of the former Barcelona FC players at their training camp. Cultural activities concluded on the final day with an insight into the world of nutrition and healthy eating at the Alίcia Foundation which included food tasting and the young people participating in their very own version of Master Chef. For Mohini, who has worked extensively on this Research Charter, this was an amazing experience and a perfect way to conclude a surreal week in Barcelona. We all attended the event in the hope that we would make worldwide connections that would further ensure worldwide collaborations with other likeminded groups with a common aim. Opportunities for attendees throughout the summit were plentiful – from making friends to meeting professionals from a multitude of worldwide organisations who were only too happy to speak to and embrace the ideas of the young people. The future work undertaken by all the iCAN groups during the summit and throughout the previous and coming year is essential. We need to continue to support momentum for initiative in order to ensure that young people have a voice in all aspects of paediatric research. 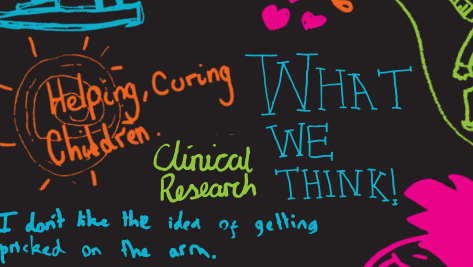 By attending this event the young people have learnt that regardless of cultural background or country of origin, the issues faced by children and young people participating in clinical research are universal. Although a little fast-paced and exhaustingly intense at times, the summit showed that research is a complex and continuous affair, which needs doctors, researchers and patients (especially children and young people) to work closely together, to ensure that healthcare research for children and young people is the best that it can be and that all have the opportunity to take part in research. Feedback from the event was very positive, although it was recommended that next year the panels should be more interactive and structured. Recommendations from the 2016 summit included more POD involvement next year – the aim being that the function of the POD will be to create a platform for individuals to interact with other young people of a similar age, make friends and be able to work together during the 5 day event. It was also highlighted that there was a need for more opportunities for parents and young people to share experiences – there certainly should have been a louder voice for the young people (something expressed by young adults and parents who attended the event). There is also the need for more sharing of best practice. Next year, it is hoped that there will be more dedicated time to hear the voice of children and young people perhaps in smaller groups to maximise the opportunity for personal contributions.. All that said, all who attended the iCAN Summit enjoyed the 5 day event massively and Team West Midlands would like to thank the organisers of iCAN for being so brave to embark on such ambitious and amazing event. Team West Midlands hope to build on collaborations formed in Barcelona, especially in relation to working together on research activities and the planning of the 2017 iCAN summit that will be held in Orlando, Florida. Claire Callens is on the Team Leader Planning Committee, Mohini is on the Young Persons’ Council and Mohini’s mom, Urvashi is now a member of the Parents’ Planning Committee. For Mohini in particular, joining the iCAN Council means that she can all look forward to continuing to work on the issues relating to paediatric research, make some amazing friends and look forward to seeing the changes implemented by a united international voice of children, young people parents and research professionals. For all of us who were lucky enough to attend this summit in the bustling culture of the beautiful city of Barcelona accompanied by warm sunshine and blue skies, it was an absolute privilege. We would especially like to thank the NIHR Clinical Research Network West Midlands who supported and funded our attendance at this summit which in turn facilitated representation of children and young people from the West Midlands. This allowed young people from the West Midlands to use their experiences and skills acquired through the Young Persons’ Steering Group, to hopefully make bigger steps in ensuring that research really is everyone’s business, not just in the UK but all over the world!